Afrin is under formal protection of Russian and Syrian forces. The real danger to Turkey is not Afrin but the much larger Kurdish protectorate the U.S. publicly announced in north-east Syria. The Turkish threats and its artillery noise have led to counter noise from Syria and more silent advice from Russia. The Syrian government wants to show that it is the protector of all Syrian citizens be they ethnic Arabs or Kurds. Russia is proud of its role as the grown up who is calming down all sides. The Turks were not consulted before the U.S. move and are of course not amused that a “terrorist gang”, trained and armed by the U.S., will control a long stretch of their southern border. Any Turkish government would have to take harsh measures to prevent such a strategic threat to the country. “This force will be a foundational force to protect the borders of north Syria,” proclaimed the announcer at the graduation ceremony. A second motive for the Turkish operation was the success of the Syrian army in the east-Idleb where “Free Syrian Army” and al-Qaeda Takfiris supported by Turkey were eliminated by Syrian Army attacks. The now unfolding Turkish operation was preceded by several rounds of negotiations. Nearly a week ago, [a] meeting between Russian officials and Kurdish leaders took place. Moscow suggested Syrian State becomes only entity in charge of the northern border. The Kurds refused. It was immediately after that that the Turkish Generals were invited to Moscow. Having the Syrian State in control of its Northern Border wasn’t the only Russian demand. The other was that the Kurds hand back the oil fields in Deir al Zor. The Kurds refused suggesting that the US won’t allow that anyway. The meeting was not exactly a success. We’re still in negotiations with Russia. They said if you turn over Afrin to the regime it will protect you. We refused. We offered to turn over Menagh airbase and some other checkpoints but they refused. New alliances will be formed with Saudi, UAE, and Egypt. Rojava forces commander General Mazlum and Ilham Ahmed have met Brett McGurk to ask the US to stop the Turkish attacks. This is a test of how reliable an ally the US is. After the negotiations with the Kurds had failed Syria and Russia, which was the negotiating entity, made a deal with Turkey. Turkey had agreed to a de-escalation zone in Idleb but never proceeded to set up the promised observation posts in the al-Qaeda ruled area. Turkey had supported al-Qaeda. Fighting it directly is against Turkish interests. It is itself too vulnerable as many al-Qaeda fighters have family and friends living within Turkey. The new deal will give Syria control over most of Idleb in exchange for Turkish control over Afrin (if the Turks can indeed take the area). In parallel to the start of the Turkish operation the Syrian army took the air base Abu Duhur in east-Idleb. It will eliminate whatever is left of al-Qaeda and ISIS in the now closed cauldron. It will then proceed further into Idelb governorate. biggerHaving Turkey take over Afrin is bad for Syria. The Syrian government clearly dislikes the deal the Russians made in its name. Any agreement with the shifty Turkish President Erdogan will likely not hold for long. But having the Kurds ally with the U.S. in a permanent occupation of the north-east is even worse. The Syrian government has rejected Turkish claims that it was informed about the attack and officially condemned the Turkish move. But it can do little against it. Its army is depleted and engaged elsewhere. Neither Russia nor Iran would support an open conflict with Turkey. Turkey has launched a quite large operation against Afrin. Its air-force is bombarding the area. It is now sending its most modern tanks. 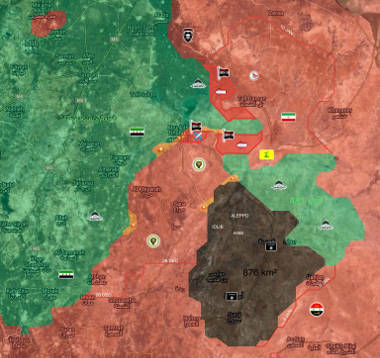 The al-Qaeda-“Free Syrian Army” Turkey supports and controls will be its front line infantry that is sure to bleed the most. Afrin is mountainous and it will be a difficult fight. Two Turkish tanks have already been destroyed. The Kurds are well prepared and armed. Both sides will have lots of losses. Meanwhile the Syrian army and its allies will have time to take over Idelb. The U.S. is left with a mess. Its strategy for Syria, only announced last week, is already falling apart. Its Central Command rejected any responsibility for the Kurds in Afrin while allying with the Kurds in the east. These are the same people. The Kurdish military commander in Afrin earlier fought in Kobane. Now Turkish planes are taking off from the U.S. build Incerlik air base to bomb the Kurds in the Syrian west while U.S. tanker planes take off from Incirlik to support the U.S. alliance with the Kurds in the east. The Arab group Jaysh al Thuwar was part of the Arab fig leaf that disguises the Kurdish command over the U.S. supported SDF in the east. It has now turned sides and is back under Turkish tutelage. (UPDATE: This has now been denied. /end-update) More elements of the SDF will change sides. We can expect “insider attacks” against the U.S. forces who are training them. The Kurdish command blames Russia for the Turkish attack on Afrin. That is laughable. Syria and the Russians had supported the Kurds throughout the war. They were the first to deliver weapons and ammunition to the Kurds for the fight against the Takfiris. It were the Kurds that changed sides and invited the U.S. occupation. It is the Kurds that announced they would ask for Saudi support. Just a few month ago the Kurdish project in Iraq failed miserably. The Iraqi government took back all gains the Kurds had made over a decade and the U.S. did nothing to help their Kurdish “allies”. Why do the Kurds in Syria believe that their immense overreach will have a different outcome?